Season 3, Episode 52 - Angie Lawrence. Dan Sterenchuk and Tommy Estlund are honored to have as our guest, Angie Lawrence. Angie is from Cedar Rapids, IA and currently lives in Marion, Iowa about 15 minutes away from where she grew up. She is the oldest of 5 kids; her youngest sibling is 18 years younger than her and was born two and a half months before Angie graduated from high school. She doesn't remember much of her childhood. Her parents separated when she was 8 and divorced when I was 10. It was a very hostile divorce, and caused a chain reaction for the rest of her life. She spent two and a half weeks in a mental ward at a local hospital (over Thanksgiving) when she was in 8th grade. She was suicidal and severely depressed. Since then, she has been on and off of several different antidepressants and anti-anxiety medications. Her grandma was a huge part of her childhood and life. 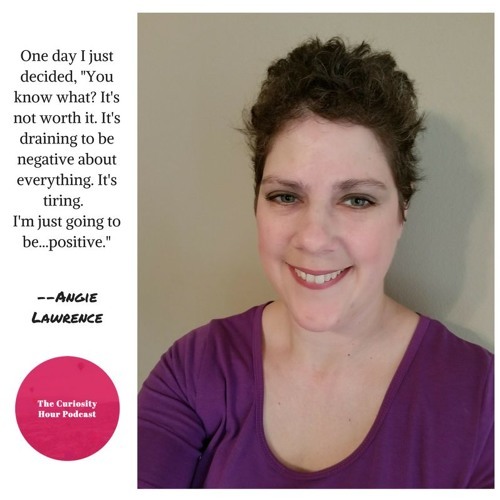 She passed away in 2014 and it has been difficult for Angie and her girls. Angie knows that her grandmother is still with her and because of her, everything in her life has fallen into place. Angie has been married to her husband John for 12 years. They have two daughters: Lexi (almost 11) and Jossie (almost 8). It wasn't intentional, but both girls were born on February 2nd, Groundhog Day. She recently started as a 1:1 associate for a kindergartner. She absolutely loves her job! She also recently started a direct sales business. She is a Girl Scout leader for her oldest daughter. At 39 years old, she has finally found her "tribe". People who are there for her no matter what, and she is there for them. She enjoys reading, connecting with friends, 90s and country music and relaxing. The Curiosity Hour Podcast is hosted and produced by Dan Sterenchuk and Tommy Estlund. Please join our Facebook Group, The Curiosity Hour Podcast, to continue the discussion about this episode online: www.facebook.com/groups/thecuriosityhourpodcast/ Disclaimers: The Curiosity Hour Podcast may contain content not suitable for all audiences. Listener discretion advised. The views and opinions expressed by the guests on this podcast are solely those of the guest(s). These views and opinions do not necessarily represent those of The Curiosity Hour Podcast. This podcast may contain explicit language.